This page is for the original game. For the reboot, see Unreal Tournament (2014). There is no Linux version of the Unreal Editor. However, there is a native version of the UCC. To run that, run "ucc" in the root of the installation folder. Unreal Wiki - A wiki on how to use Unreal Editor, UnrealScript and other technical aspects of Unreal Engine. Unreal Admin Wiki - A wiki on how to manage Unreal multiplayer servers. UT99.org - An informative forum community full of UT99 tweaks, modifications, mutators, skins, voice packs, and more. All GOTY editions and later patches remove this check. The Linux version is available as a downloadable installer only. If planned to run the Linux version on the modern system please use this bundle, it contains the native Linux port with unofficial 451 patch applied and contains optional goodies. It will generally work with any version as it only requires the main files to play it. 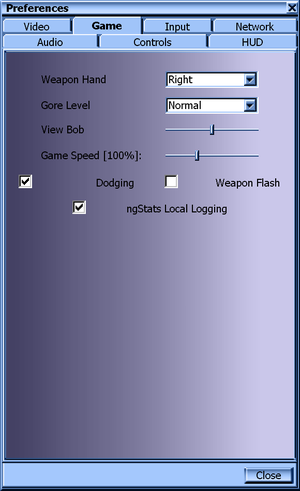 GOG Windows installer can be unpacked with the use of InnoExtract. However, in case of Steam version, you need to use Wine to get the files you need or just use Lutris which includes 2 install scripts to choose from, Wine only and Steam + native executable. The 2nd alternative is to use flibitijibibo's pack (Getting the extras is recommended for this). Available for free. Included with Unreal Tournament: Game of the Year Edition. See Bonus Content for a download link. Available for free. See Bonus Content. A list of all official patches can be found here. Note that v436 is the latest official patch available. UTPG Patches - Needed for connecting to many servers. Oldunreal Multimedia Patches - Provides sound and graphic fixes for the game. Unreal Tournament OS X GOTY for Mac. UT Bonus Pack 1 - Three new models, a package containing six related mutators, and 11 maps. Included in the GOTY edition. UT Bonus Pack 2 - Three new mutators and two maps. Included in the GOTY edition. UT Bonus Pack 3 - Two texture packs and six maps. Included in the GOTY edition. UT Bonus Pack 4 - Two new models, two texture packs and twelve new maps. 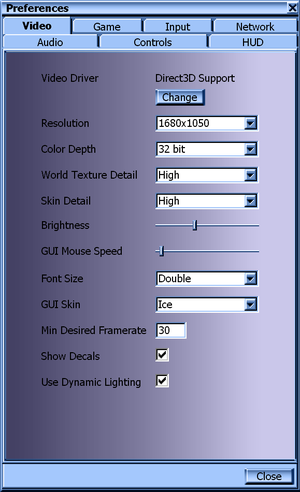 The vast majority of graphical tweaks are accomplished by editing the game's .ini configuration files. Installing the Direct3D 10 renderer allows you to play the game in high-resolution, widescreen, and Direct3D 10. There's also a Direct3D 11 renderer (currently no significant changes from D3D10 renderer), D3D9 and OpenGL renderers. Be warned that when playing online you may be kicked from servers using anti-cheat plugins. Replace the original textures with S3TC Textures and get amazing detail. Do not use these server-side. 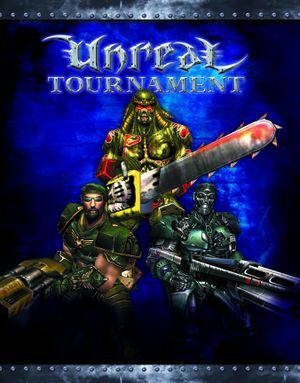 Various modifications, custom content such as characters, maps, mutators, and total-conversion mods can be downloaded and installed for Unreal Tournament. Find the line CacheSizeMegs, set it to higher values like 64 or 128. User.ini contains most user settings. Tiny text; use "Double Font" option to increase text size. Click the resize icon in the top right corner of the in-game taskbar. For Windows 8 and later use the Unreal engine Direct3D 10 renderer. A well known feature of UE1 is that it does not tolerate high frame rates well. At around 100fps certain visual effects will begin to malfunction (eg. underwater effect will be delayed, easily visible in DM-ArcaneTemple), and at very high frame rates the speed of the game will be increased. Find the lines DesiredFOV and DefaultFOV. Set the values to the ones you want. Mouse sensitivity is affected by the field of view and Windows Pointer Speed. 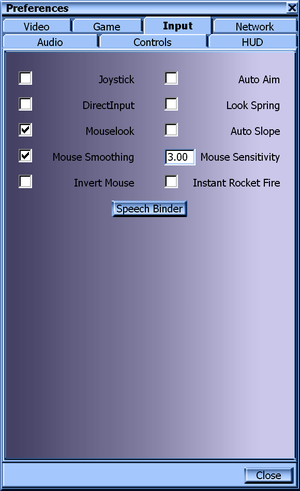 Therefore it is recommended to use mouse-sensitivity.com to calculate the sensitivity based on the desired field of view and make sure the DirectInput option in Preferences -> Input is checked as this option ignores the Windows Pointer Speed. Trigger axes on XInput controllers not recognized. Up to 7.0 output. May require DirectSound 3D restoration software. See Restore 3D sound for OpenAL Soft HRTF. After the splash screen, the screen turns black and the game crashes. The .umod filetype isn't recognised by the computer. Extract and run the downloaded file, install to any folder on your computer. Open the newly created shortcut. 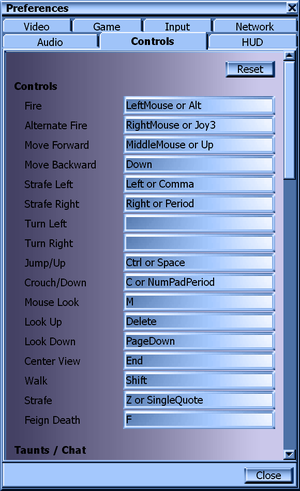 Set the path to your Unreal Tournament folder. 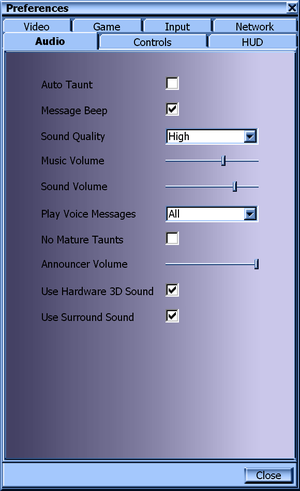 Download the ALAudio for Unreal Tournament, Windows Version, and copy its contents (not the folder) to <path-to-game>\System. Open UnrealTournament.ini and search for [ALAudio.ALAudioSubsystem]. Replace everything under that section with the new settings at the bottom of the post here. Replace UseHRTF=Autodetect with UseHRTF=Enable. Follow the instructions on this guide. Set the period count to 2. OpenAL created by Loki Software uses OSS by default. Depending on the installation method you have chosen, you may also comment or uncomment one of the 3 Audio Devices. This happens only on modern CPUs, post Pentium 4. Pick one of these fixes. Download OpenGLDrv.so from this page. Make a backup of the original OpenGLDrv.so file located in System folder of the game and replace it. Open and paste this script and save the file. Run chmod +x <name of the file> in Terminal. Start the script to play the game. 6, 7, 9, 10, 11 6 was included with the original release. 7 was added via Patch v413 and replaced Direct3D 6 support. To add in Direct3D 10 and 11 support, see D3D10/High Res/Widescreen Fix. A3D, OpenAL, FMOD Both OpenAL and FMOD are available only through community-made patches. Be aware that the Linux version uses Loki Software's OpenAL which requires OSS in order to have sound. SDL SDL is Linux version only. GameSpy The multiplayer host can be changed. ↑ 3.0 3.1 File/folder structure within this directory reflects the path(s) listed for Windows and/or Steam game data (use Wine regedit to access Windows registry paths). Games with Steam Cloud support may store data in ~/.steam/steam/userdata/<user-id>/13240/ in addition to or instead of this directory. The app ID (13240) may differ in some cases. Treat backslashes as forward slashes. See the glossary page for details.